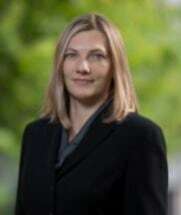 Elisabeth S. Bach-Van Horn is an Associate with the firm's Family Law Practice Group. She joined the firm in 2011. Prior to joining the firm, Liz was a staff attorney with Legal Aid of Western Missouri, representing victims and survivors of domestic abuse in divorce, paternity, and child custody matters. In addition to representing clients in a variety of family law matters, Liz has particular training and experience in representing children’s best interests as a Guardian ad Litem, and in representing clients in collaborative divorce, a process that is designed to address all of the traditional divorce issues in a manner which is conducive to positive results for the whole family.